Sketches for 'Study of the Painter’s Dead Mother'. But what of his own times? What did Lenkiewicz see as the state of play regarding death in the early 1980s? 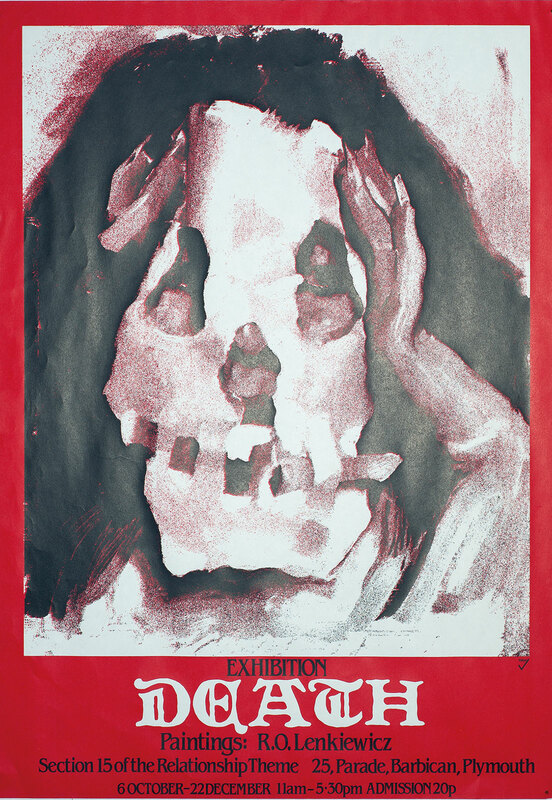 Lenkiewicz exhibited his paintings and research notes on the theme of Death between October and December 1982. The exhibition was the final part of what can be seen as a trilogy of investigations into the problem of mortality. The first part, Old Age, was shown in 1979 and was followed by Suicide in 1980. Sitters for the Death Project included the City coroner, doctors, surgeons and a number of local clergy, all of whom would have been aware of Lenkiewicz’s provocative thesis regarding the ‘death industry’. The large group portrait titled Mr Earl Senior, of Earl of Plymouth Funeral Service; Employees and Family, is an homage to Velázquez’ painting Las Meninas, and shows the funeral director and entourage in a coffin warehouse. That Lenkiewicz was less than sympathetic to those who profited from contemporary death rituals was signified by the inclusion in the painting of a crumpled photograph of a vulture’s head. Lenkiewicz was asked what the photograph signified by Dr Philip Stokes -- Lenkiewicz replied: "It’s them." 1. The putrefying athlete trying to get a message through. 3. Woman copulating with Death the grey man. 5. “Go away — nearer!” Studies. 8. Death and the Maiden. 10. Myriam with dead bird. 12. Miss Lesley Karen Ciambriello with her children. 13. The painter with Mary, meeting the painter with Mary. 14. Myriam with paper mask. 15. Mary with dead bird. 17. “A passion for being, an anxiety at riot sufficiently being’. 20. Death presents peace to the maiden. 21. New lovers dancing on the graves of previous lovers. 22. Man devouring his entrails. 24. Andy Lynch returning a pound note to the painter, shortly before his death. 25. Andy Lynch with oak leaves. 26. Mrs Dempster with her son. 27. Self-portrait with piece of paper and Yana. 29. Young man and old man fighting. 30. The painter’s death-bed, with children and women. 31. Yana with paper mask. 32. Self-portrait as old fool embracing Yana. 33. The painter dying watches himself rutting. 34. Man in a boat: suicide study. 36. The resurrection of Mary: study. (adjacent, papier-mâché figures). 37. Mary with dead white bird. 39. ‘Diogenes’ (the painter’s assistant) double study. 40. Death with woman in the grave. 41. Myriam with paper hat. 42. Mr David Bishop: Her Majesty’s Coroner., For the City of Plymouth and South West Devon. 43. DR. BRIAN POLLARD: GENERAL PRACTITIONER. 44. The Ascension of Andy Lynch with two of the painter’s sons. (unresolved study). 45. The Reverend Walker: Administrator of the Central Methodist Church Hall. 46. Father Samuel Philpot: Administrator of St. Peter’s and All Saints, Wyndham Square. 47. Canon Bede Davis: Administrator of the Cathedral Church of St. Mary and St. Boniface. 48. Myriam with Moebius strips. 49. The Reverend John Watson: Vicar of St. Andrews Church, in front of Piper’s ‘Creation’ window. 50. Mr Earl Senior, of Earl of Plymouth funeral service; employees and family. 52. DR. HUNT AND COLLEAGUES IN CONFERENCE. 53. MR IAN SUTHERLAND JONES: M.A., M. CHIR., (Cantab)., F.R.C.S. (Eng)., SURGEON. 54. MR A.J.M. BRODRIBB: B.Sc., M.S., F.R.C.S., SURGEON. 56. DR. SHEILA A. CASSIDY: MEDICAL DIRECTOR. 57. African children with protein deficiency. 58. Self-portrait with self-portrait at ninety. 59. Still-born child in kitchen. 60. Reuben Lenkiewicz drawing skulls. 61. The Father eats the son.